Abrams has spoken in the past about how Harrison Ford's injury on set actually allowed him and co-writer Lawrence Kasdan more time to rework the relationship between Rey and Finn. And even though he stops short of actually saying as much in the clip (possibly due to the recently settled court case regarding the incident), that's probably what he's referring to when he discusses the rewriting of the Finn and Rey scenes. 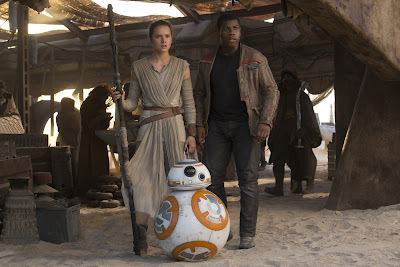 The 3D Blu-ray of Star Wars: The Force Awakens hits shelves on November 15th. Another clip from the Abrams commentary, discussing Kylo Ren's fateful decision, and a new deleted scene have also been released.